This scrumptious Blueberry Baked Oatmeal can be made using fresh or frozen blueberries. It's naturally sweetened with maple syrup and kissed with cinnamon, giving it a french toast oatmeal vibe we can't get enough of! Grease a 10.5" x 7.5" or 9" x 9" inch baking dish with oil or butter and set aside. Next melt a tsp or two of butter in a large pan/skillet and toast your oats, pecans, and almonds until fragrant and toasted, stirring occasionally. Transfer oats and nuts to a large mixing bowl along with cinnamon, baking powder, salt and nutmeg. Stir to combine. In a separate bowl, combine the milk, maple syrup, eggs, melted butter, and vanilla. Whisk until blended. Set aside ½ cup of the berries for topping, then arrange the remaining berries evenly over the bottom of the baking dish (no defrosting needed if frozen). Combine the dry and wet ingredients and mix until no dry oats remain. Pour over berries and gently spread mixture evenly with a baking spatula. Scatter the remaining berries across the top and pat into the oats. Bake for 40-45 minutes, until the top is nice and golden. Remove your baked oatmeal from the oven and let it cool for a few minutes. Before serving feel free to drizzle over some extra butter, maple syrup, milk, or any of your go-to oatmeal toppings! For a vegan baked oatmeal, use flax eggs and melted coconut oil in step 5. In the photos I topped my oatmeal with pure maple syrup, fresh raspberries, and whipped cream. I also LOVE it with a little extra almond milk poured on top too. Dress it up however you'd like! Have extra blueberries to use up? 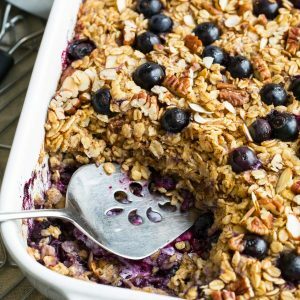 You could even make a blueberry jam or sauce to serve with this baller baked oatmeal! I've done this before and adored it!